It would have been fitting had Brian Lara's first Test century at his home ground in Trinidad led West Indies to a series-levelling victory against Australia. As it was, his 122 in the second innings was not enough to hold off the irrepressible Aussies, even if it did evoke memories of his heroic deeds in 1999. But as well as breaking his home hoodoo, the left-hander quietly achieved something else at Port-of-Spain, something far grander in the wider scheme of things. When Lara danced down the pitch to Brad Hogg early on the fifth day for yet another boundary, he became the leading West Indies run-scorer in the Caribbean. Names such as Sir Garfield Sobers, Desmond Haynes, Sir Viv Richards and Clive Lloyd now trail in Lara's considerable wake. Such precise statistics can often be misleading, but in Lara's case this one correctly portrays him among the greatest batsmen his country has produced. He needed just three more innings than the legendary Sobers to overtake his benchmark 4,075 runs. And Lara's record shows him to be a superior performer at home to the batsmen that made West Indies such an invincible force in the 1970s and 80s. Although not quite the force as he is on home soil, Lara is certainly no slouch on the road. His 46 'away' Tests have produced 3,795 runs at an average of 46.28. On runs scored, that puts him behind Richards (5,404), Lloyd (4,634), Greenidge (4,349) and Sobers (3,957). 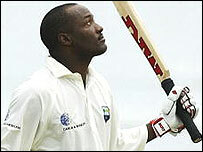 But Lara, revealingly, has played less Tests away from home than all of that quartet. Given the tendency to view bygone eras through rose-tinted glasses, is the mastery of Lara appreciated today? Or are we only likely to fully gauge his genius once it has expired, and re-runs of his many great innings are all we have to admire? 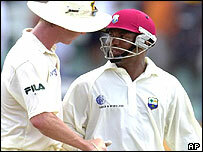 Australia captain Steve Waugh is unafraid to admit his admiration of Lara - off the field, of course. "I don't think I have ever seen him hit a bad hundred," Waugh said after observing Lara's crunching duel with Brett Lee in the second Test. "It was great Test match cricket to watch - a quick bowler bowling as fast as he can against a world-class batsman." Lara, who turns 34 during the third Test, is said to be obsessed by personal milestones, but the new Windies skipper spoke selflessly after the defeat. "A hundred was not what I was looking for," he said. "I was looking to bat as long as possible, hopefully for the entire day." After returning from injury prior to the World Cup, Lara said he wanted to reclaim his mantle as the best batsman in the world. Who said he ever lost it?